It’s spring, and I’m sick! Outside is beautiful all the time, sunny (except a major storm this morning! ), hot, enjoyable, and all I can do is to stay inside, all covered, coughing… And so I NEED comfort food, I really do!!! I’ve used ready made dry lasagne sheets. I made a vegetable ragù with diced tomatoes, aubergine, onion and courgette. I made my usual yoghurt béchamel. 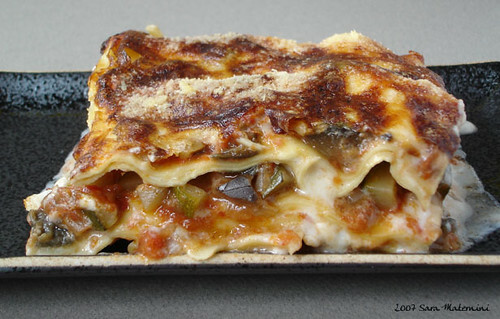 One layer of pasta, one layer of veggy, one layer of béchamel, one layer of pasta, and so on and on…. I love lasagna, the cheese on top looks nice and crisp, just the way I like it. MMmmmm!!! My favorite kind of lasagna! Your’s looks absolutely heavenly, Sara! Sara, I do hope you feel better soon. The lasagna looks incredible but you should really put your feet up and rest! What a cute blog with gorgeous food photos! Just wanted to say thanks for stopping buy because now I must subscribe to you. I love your sense of humor — When I was a little girl, every time I got sick, I dictated my will to my mom, leaving all my possessions to my dog…— it’s priceless! I hope you feel better soon. Your lasagna looks amazing. I am so terrible at making lasagna and having it stay together when served. I am jealous of yours. Hi, sweetie, I hope you’re feeling better! Your lasagna looks so delicious, I love the fact that you used vegetables! mmm, quelle merveille..ma non era francese?